Is there a way to earn more money than blogging and YouTube? This question will surely come to your mind too. Whenever you search on Google, the best way to make money from internet, because of the search results you see, Blogging is reported only about YouTube. But today not because there is a new income source which is not about Rozbuzz We Media What is Rozbuzz We Media? And how can you join it? We will learn in detail. There is no way you can make some income online, but in no way will you get money without any hard work. Rozbuzz is not a single non-Google approach that can be erarning before UC Web also comes Which is popular among the people. 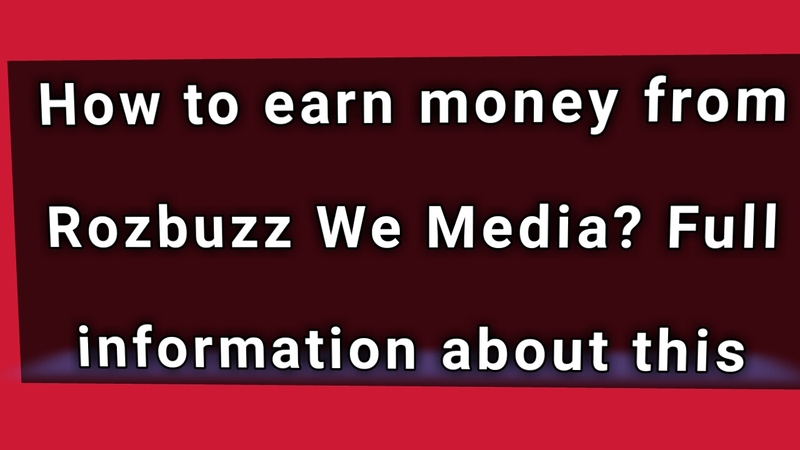 What is Rozbuzz We Media? This is a content sharing platform where content can be shared both in both video and text format. As we post video on Blogger and text on YouTube. Now about 5 million people can join this and share their content on daily basis. In this you can create your blog in Hindi, English, Tamil as well as many Indian languages. The publishers joining here get an opportunity to earn a lot of money in which content base revenue income will be given according to your every article and popularity. It's not as popular as Blogger, WordPress or UC media, but it's a platform that can soon be popular and its terms & conditions are easy and this is the right opportunity to connect with it. In order to join Blogger, we need to have an email address and Rozbuzz We media has a phone number to join us. Just verify an OTP code and you can join it in 1 minute. As soon as you open it, you see the option of register an account. Where you need to add a phone number and click send OTP and then verify password. Click on the Terms & Condition checkbox to complete the signup. after the signup, you are ready to login to the account and then you can enter your main dashboard by entering your number and password. Where you have to submit and submit the account name, description, Avatar, Email, Language, Category. If you already have a blog then you can link it to an experience so that you can easily get approval. Access to Content Publisher is not available immediately, We media first verifies, then informs you on email whether you can become a content publisher on it or not. If you want to make Rozbuzz we media publisher before and after making, you need to know about some FAQs. There are lots of questions related to post, payment and account. The account should be 2 weeks old. Multity should have at least 300 points. Week must be at least 3 days post and must be approve two weeks continuously. After completing all these requirements, you will become an Advance user in which you will get more opportunity to publish Article and Video, along with your reward. Now the Adsense account now costs $ 100, then your balance gets transferred to your account. The same process is rozbuzz we media. When your account becomes 1000 rupees, you can transfer them to the account. For this, you must first add to Bank Name, Beneficiary Bank Account No, Beneficiary IFSC Code, Pan Card Payment method. This is the most important factor of media and after your account is approved you can not go against its rule and whatever content you publish will be in the form of all the complication. Article Competition: It starts from Monday to Sunday, which gives you information first. According to the terms given in it, you will have to submit the article and we media revises all the content and its winner is informed about next Friday. At the time of competition, at least 7 articles have to be published in the week.Maximum 45 articles will be posted in one week.On the day of Writer, maximum 7 articles can be published. Article should be original. Video Competition: It is similar to article competition. The rest of the content you have to publish something like this. The video size should be within 30MB and should be in MP4 format. Can not apply any famous company logo, app logo or YouTube channel logo on video cover. 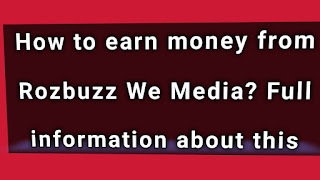 Friends, Rozbuzz We media can be a good part time income source for you, but some of these terms and conditions can be a little distracted. Therefore, you should remember four tips when you join the media: Originality, Influence: View / Recommendation, Rate, Health Activeness This is what you can take ahead and to help each one. If you've got any thoughts, please share within the comment.